The upshot of a protracted divorce in California oftentimes is a spousal support payment that, depending on the party, can be viewed as either a welcome benefit or financial burden. Where previously in California a supported spouse could expect lifetime payments, the law has evolved so that now the norm is a much shorter period of time. Whether you are expecting to receive spousal support or make support payments, you should know the current law. In a divorce, California provides for what is called a Gavron Warning, which sets guidelines as to when the spouse receiving support will be expected to begin either partially or fully supporting him or herself. Support payments after a Gavron Warning are eventually expected to end completely. This legal principle was first formulated in the case Marriage of Gavron, (1988) 203 Cal.App.3d 705, and typifies the movement away from the previous policy of lifelong payments. Men, women, and domestic partners are treated equally under the rule, which was codified in 2000 under California’s Family Code Section 4330. Under this section, the supported spouse must become self-sufficient within a reasonable period of time. The definition of “reasonable” depends on the length of the marriage. For those marriages that lasted fewer than ten years, half the duration of the marriage is considered reasonable. So if the marriage lasted eight years, the supported spouse would receive payments for four. For marriages of more than ten years, considered “of long duration,” various factors come in to play, such as earning capacity, how much the supported party contributed to the supporting party’s education or career position, and whether there had been any domestic abuse during the course of the marriage, among other things. Parties can agree to include a Gavron Warning in their Marriage Termination Agreement. Alternatively, an attorney for the supporting spouse can also request that the judge give the warning during divorce proceedings. Typically judges will wait before issuing the warning so as to give the supported spouse time to become self sufficient under the thinking that it would be unfair to immediately require a homemaker to become gainfully employed if the person has no marketable skills or has been out of the workforce for an extended period of time. The longer the marriage, and the older the supported spouse, the more time it will generally take for a judge to issue the warning. Regardless of the circumstances, a judge’s discretion will always be a factor in determining the length of time the supported party will receive payments, and a Gavron Warning need not be given at all if a judge so decides . Additionally, the supported spouse must make a reasonable good faith effort to support him or herself. Failure to do so will be another factor for determining whether spousal support will be modified or terminated. 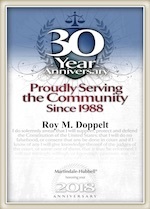 If you are contemplating a divorce, or currently engaged in a divorce proceeding, San Diego divorce attorney Roy M. Doppelt can represent you with compassion and skill through this trying time. Mr. Doppelt has over 20 years of experience handling divorces in California. Doppelt and Forney, APLC proudly serves clients in San Diego, La Jolla, Escondido, and throughout Southern California. For a free confidential consultation, contact us online, or call us at (800) ROY IS IT (769-4748).